The track is very clear in the foreground but once onto the arete it breaks up into a myriad of paths. 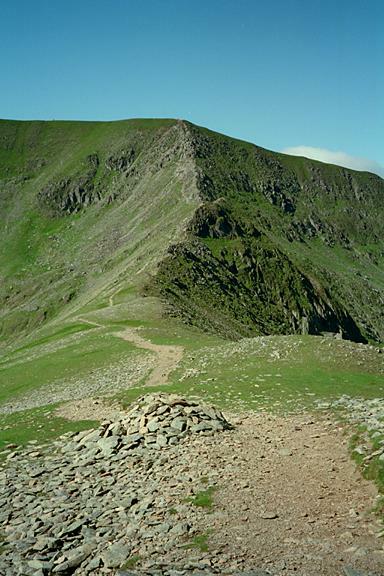 Compare this picture with that of Swirral Edge from Helvellyn. There is a noticeable crest midway along the Edge where the most commonly used path avoids the top by taking a lower level on the southern side. This is the easiest way. Once past this crest I find it easier as well as more enjoyable to keep as close to the top of the ridge as possible, all the way up to the summit plateau. Smaller version of this picture.